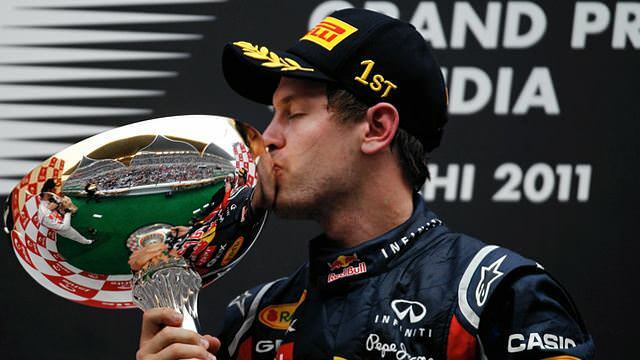 This is F1Minute - Vettel utterly dominates inaugural Indian Grand Prix. Sebastian Vettel led the Indian Grand Prix from pole position, and was unreachable throughout, also securing the fastest lap of the race. Second place Jenson Button only managed to close the gap to him after pit stops, before watching the Red Bull disappear into the distance again. Button was in second after getting past Mark Webber at the start, Fernando Alonso was also pushed out wide, but he made up positions to get back up to third, joining the other two on the podium. There was first lap carnage thanks to Rubens Barrichello, who outbraked himself. Kamui Kobayashi retired then and there, Timo Glock came in to the garage for the final time on lap four. Other retirements included Sébastien Buemi, whose Toro Rosso came to a smoky halt, Felipe Massa who repeated his suspension/kerb issue from qualifying, and Pastor Maldonado who had gearbox trouble. Before he retired, Massa had a coming together with Lewis Hamilton, as the McLaren tried to overtake. Another incident in their growing history, and this time it was Felipe who got the drive through.